This week we’re featuring Tori S. of Jake’s Journey to Be a Little Man, a blog that chronicles the life of Tori’s son, Jake. 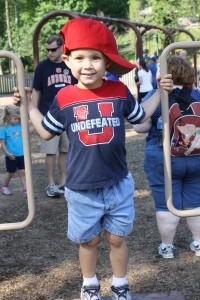 Jake has apraxia, which is a motor speech disorder that interferes with his ability to form individual sounds and words. Apraxia is not caused by poor oral muscle development, but rather by a miscommunication between the brain and the muscles. So while Jake understands what he wants to say, his brain has trouble signaling his muscles to make those sounds. In our interview, Tori discusses the home-based speech therapy techniques that she uses to help Jake become more verbal. You’ve blogged about how much Jake enjoys using Tiga Talk, an app for apraxia. Have you noticed a difference in his articulation and/or self-confidence with the use of this app? Does Jake use other apps for speech therapy? Tiga Talk was the first speech app I bought at the recommendation of a fellow blogger. In September of 2011, when Jake turned three, he had a 5-10 word vocabulary and the only word he used on a consistent basis was “pizza!” From September until December of 2011 he worked on consonant-vowel combinations, so getting Tiga Talk in January this year was a natural fit for him to help strengthen basic sounds. Also, just to clarify, Tiga Talk would be a good app for a child with any type of speech disorder/delay. It’s not just for kids with apraxia. In February I bought the Speech-EZ Apraxia Program app. Two days a week he has speech therapy for thirty minute sessions and primarily works on Kaufman cards. I wanted something that I could do with him at home that reinforced what he was learning with his SLP, but I was afraid if I bought my own set of Kaufman cards, he would get bored. The cost of Kaufman cards and Speech-EZ was about the same, so after much debate, I decided to go the iPad route. This program is essentially flashcards and hand cues. In the next week I’m going to get some new speech apps for the summer. I know there’s a lot of free/inexpensive apps that are good. I’ll keep you posted on my blog! I think that the iPad has been a vital tool in improving Jake’s articulation, but it’s been only one piece of his therapy regimen. He gets excited when he succeeds at a game where his voice determines if he “wins” or not, which has to build his self-confidence in his speaking abilities. I’ve got to admit though, he doesn’t just play speech games! He’s also a Temple Run addict and is so proud when he gets a high score. So far, his highest score is 218,000. That wows me … especially when my two older sons score just a little higher than their little brother. What are some of the other home-based speech therapy activities you do with Jake? Through trial and error, I’ve learned that Jake can say his words best when we go through the entire Kaufman list without a break. For the past month or so, I sit outside on the patio with him or lay in bed propped up on pillows, and I say each word on my list and he repeats it after me. When he completes 100 words or so, he gets to do a fun activity. 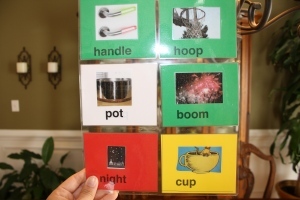 Our SLP, however, has said before we can move beyond the first set of Kaufman words, he has to be able to look at the picture on the card and “recall” what it is. He really struggles with this. So, this week I got out the card stock and made about 150 flash cards with the words that he needs to master. I used some of our own family pictures, took pictures out of his favorite books, and got the rest from Google Images. I also typed the word at the bottom of each card, hole-punched the corner, sorted each set by sound in order from easy to difficult, and then attached each set with a metal ring. My other son practiced his sight words this way when he was in kindergarten and he loved quickly flipping through his words. I thought I’d try the same for Jake. Maybe using flashcards in this way will be more engaging for him. 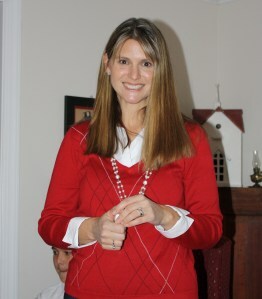 I’m blogging on it this week if you’d like to check out the details. Jake will be four in three months. It is very important to me that he moves past this first set of Kaufman words soon, so I’m going to shoot for reviewing these cards seven days a week. That way, if I miss a day or two, we’ve still got a lot of practice in. I can also do different games with these cards if he starts getting bored. Last, I’ve learned that encouraging proper speech ultimately has to be an all day, every day, way of life. It doesn’t stop when you’re at the park, grocery store, running errands, cleaning house, doing laundry, etc. If Jake says a word wrong or points/grunts, I make him say it the right way to the best of his ability. That takes some practicing to live your life that way! Also, I try and not let him watch a lot of television, although with two older brothers, it is hard to keep him away. After the initial evaluation, you learned basic sign language. Does Jake still use some sign language or any other AAC device? We only used basic sign language in the beginning, although if I had to do it over again, I wouldn’t have been so against it. I thought signing would give him incentive to sign for things instead of trying to talk. After seeing what great results we’ve gotten from hand cues in speech therapy, however, I think signing would have been a good idea from age two to three when he was basically silent. Now, he uses only two signs … “I love you” and “I’m sorry.” These are two vitally important phrases for a Lil’ Man to know! He does not use a AAC device and no one has ever recommended one to us. You’ve mentioned that undergoing a test like the Kauffman Speech Praxis Test is quite stressful for Jake. What advice would you give to other parents who are trying to emotionally prepare a child for a test? This is a hard question and I don’t really even know the answer myself! I do know that it is also very stressful for me and next time, I told my husband he’d have to take my place! Maybe Jake senses my anxiety and responds accordingly. I’m not sure. I’ve never actually talked to him about it because I didn’t want to draw attention to the “test,” but next time since he will be four and more mature, I’ll probably take a different approach. Jake was previously uninterested in using flashcards, so you turned them into a version of musical chairs instead to engage him. What are some of the other tricks you use to keep him practicing his words? With that being said, for the past month, he’s gotten bored with his Speech- EZ iPad flashcards, which was why I tried the version of musical chairs that I read about in Leslie Lindsay’s book “Speaking of Apraxia.” This book is packed with a ton of at-home activities that I can’t wait to try. Summer is going to be a great time to experiment. There are a few “tricks,” however, that have worked on a consistent basis. We listen to Kids’ Express Train KET SET 1 in the car and I purchased this CD because our SLP recommended it. Each song has a different speech agenda, which is great for reinforcing whatever he is having trouble on in speech. We even used music to help him say his name and age because he’s always struggled when people ask him this question. My mom came up with a jingle that says, “My name’s Jake. I am three.” One day I’m going to video him singing it and put it on my blog. It’s so cute! Last, but not least … books! I’m very lucky because Jake has always loved books. Over the past month or so, I’ve started asking him questions about pictures on the pages. Six months ago he couldn’t answer me, but now many times he is able to respond. If he doesn’t say a word correctly, I break the syllables up and over pronounce it. He will repeat it after me. If he’s having a lot of trouble with a particular word, I make him say it a couple of times. Having a child diagnosed with a speech disorder takes some adjustment. How have your other children coped with it? Out of all of the worry and heartache that apraxia has caused me, Jake’s brothers have never been anything other than supportive and helpful. Maybe it’s because they are older (8 & 14) or maybe it’s because they are male and feel the need to “take care” of their little brother who’s not quite like everyone else. (Sometimes a good thing because he can’t say all the bratty things that the average preschooler says!) Maybe it is because Jake, for the most part, is a good child with a sweet laugh and an easygoing spirit. For these reasons, I feel incredibly blessed. Having a child with apraxia has absolutely been a lifestyle change for all of us and we have had our fair share of ups and downs. Overall though, we have adjusted and have pulled together to fight this puzzling disorder. As Tori points out, it’s indeed important to cherish the fun little moments and avoid having your child’s speech disorder become his whole identity. Be sure to check out Tori’s other tips and resources on her blog. Thanks so much, Tori, for sharing your story and your wonderful tips for home-based speech therapy activities!